This is a luxurious, supremely elegant pasta dish that takes less than 10 minutes to make. 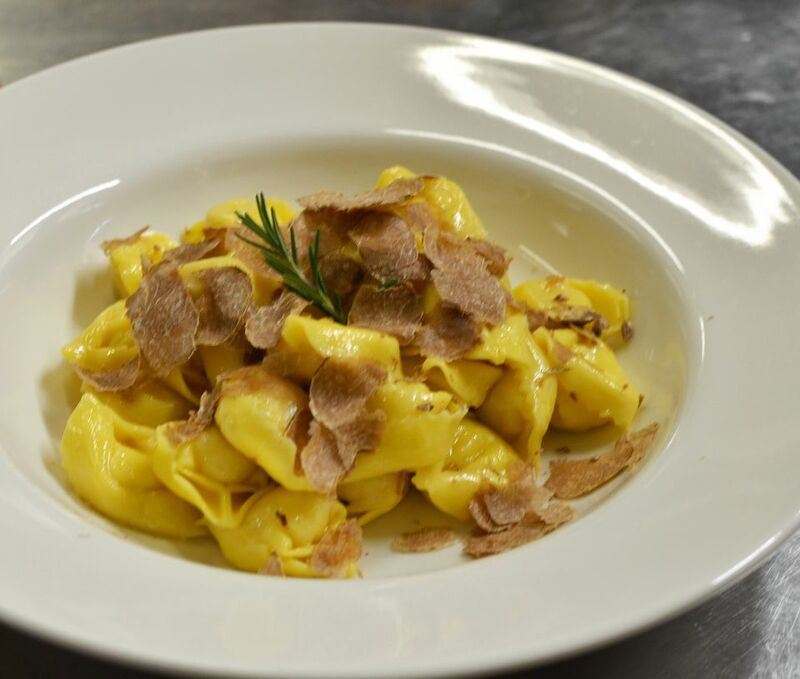 It would make an impressive and romantic Valentine's Day dinner, with prized white truffles shaved over fresh tortelloni filled with five Italian cheeses: ricotta, mascarpone, Parmigiano-Reggiano, mozzarella, and Pecorino Romano. Using store-bought fresh pasta makes it convenient and fast, but with precious white truffle shaved on top—it's definitely not an everyday or boring dish! White truffle is one of the most expensive foods, by weight, in the world, but its aroma and flavor are so intense that you only need a tiny bit (just half an ounce, in this case) to transform something as pedestrian as cheese-filled pasta into a very special creation. You can find fresh truffles in specialty food shops and delicatessens as well as from online suppliers. In the past, pigs were used to sniff out wild truffles in the forests of northern Italy, but these days, truffle dogs are the truffle hunters—because it's easier to train them not to eat the truffles once they find them! Pigs being pigs, they get overwhelmed with greed once they get a whiff of that heady truffle scent. Store fresh truffles in your refrigerator, gently wrapped in a paper bag or paper towel and inside an airtight container, for up to 4 or 5 days. Make sure to keep them dry! If the paper towel gets damp, replace it with a new one. Pair this pasta dish with a Rosso del Veronese red wine, such as Masi Campfiorin. Champagne or an Italian sparkling white, such as Franciacorta, would also go well! Adapted from a recipe courtesy of Victor Pena Guilera, Culinary Research & Innovation Manager, Pastificio Giovanni Rana, developed specifically to pair with wines from Masi Agricola winery in the Valpolicella wine region of northern Italy, near Verona. Bring a large pot of salted water to a boil over high heat (add about 1 tablespoon of coarse sea salt or kosher salt per 2 quarts of water). When boiling, add the tortellini and cook for 3 minutes. Meanwhile, melt the butter in a pan over low heat. When the pasta is ready, drain it well, add it to the skillet with the grated Parmigiano-Reggiano cheese and toss well to coat. Transfer the tortellini to a serving platter (or individual shallow serving bowls) and shave the white truffle very thinly on top using a mandoline slicer or a truffle shaver. Garnish with the sprigs of rosemary and serve immediately.